Soybeans have started to emerge, and as you may expect, this is a prime time to scout fields for early season seedling diseases. Seedling diseases are caused primarily by fungi or fungal like organisms that , under the correct conditions (moisture, temperature, susceptible variety) can colonize the seed or germinating seedling and cause the seedling to die before it reaches the soil surface, or soon after emergence. Typically these pathogens will kill root tissues and girdle stems, and therefore can be somewhat challenging to diagnose in the field. In addition, multiple diseases may be present on a seedling at a given time, further complicating the matter. There are several species of Pythium that can infect and cause problems for soybeans. Pythium are oomycetes, which are fungal like organisms that thrive in wet, saturated soils. Symptoms of Pythium infection include underdeveloped roots with a tan brown appearance. When running the roots in between your fingers, the outer tissues will easily slough off. Plants will often wilt, and have a wet, mushy lower stem. Because there are numerous species of Pythium that can infect soybeans, this disease complex can be observed over a range of temperatures. The most important factor for disease development are wet, saturated soils soon after planting. Seed treatments containing oomycete specific active ingredients can help management, in addition to improving drainage in problematic areas of the field and planting into warm soils to increase growth and germination. 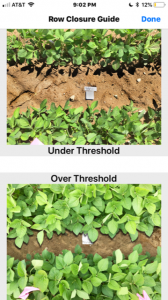 Phytophthora sojae is the most common species associated with Phytophthora seedling blights, although recently other pathogenic species have been associated with soybeans. Phytophthora are similar to Pythium in that they are oomycetes, and therefore are favored by wet, saturated conditions soon after planting. Early symptoms of Phytophthora are similar to Pythium and other seedling diseases; however, this disease often causes a black/brown lesion that will extend from the roots to several inches above the soil line on the main stem. These plants like are easily removed from soils if pulled from the ground, as the root system will be greatly reduced or rotted. Resistant varieties, especially those containing multiple P. sojae resistance genes, are very effective for managing this disease. Seed treatments with oomycete active ingredients can also be effective. There are numerous Fusarium species that cause soybean seedling diseases. Consequently, you can find Fusarium on soybeans growing under many different environmental conditions. Stressed plants tend to succumb to these diseases more frequently. 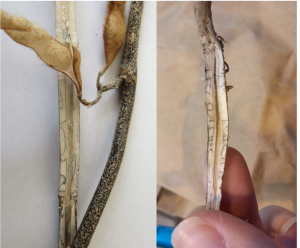 Fusarium infected plants are often stunted and can have a weak, spindly look to them. Root systems are underdeveloped and may appear brown. Rhizoctonia solani is a fungus causes seedling disease in soybeans. Symptoms include red to brown sunken lesions (notches) at or just above the soil line, that extend to the roots. Root systems are underdeveloped and rotted. Although environmental conditions that cause this disease vary with the genetic makeup of the pathogen, the disease typically is not favored by saturated soils but rather moist soils at planting. Chemical burn or the halo effect in seeds treated with Fluopyram. Plants will grow out of these symptoms and yields should not be impacted. Pre-emergence herbicide damage. Typically PPO-inhibitors or inhibitors of photosynthesis can occasionally injure soybeans when planted into cool, wet soils. Heavy rains can also transfer herbicide containing residue onto leaflets, resulting in necrotic spots and chlorosis that can resemble seedling disease or even foliar diseases such as Septoria or Cercospora. Unlike seedling disease, herbicide-damaged seedlings are typically fairly uniform within a field. Remember, seedling diseases are complex. Make sure to examine the entire field and look for the overall field pattern, and ask questions about the variety, herbicide use, and planting date. Samples can be sent to the UI Plant Diagnostic Clinic for examination, but keep in mind that multiple factors and diseases may be involved.